I have probably come across more than a dozen books about God's purpose for each of His children and how we all need to live intentionally in this mindset. 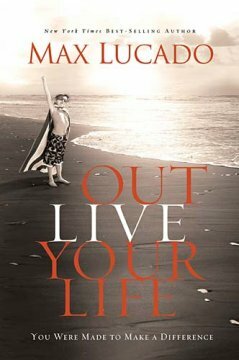 Max Lucado's "Outlive Your Life" definitely isn't the most ground-breaking topics in the Christian Lifestyle genre but it is not enough reason to sleep on it. Lucado's ability to laugh at himself is one of the most refreshing tones I've read in a long time. I have been a little too hard on myself lately and this is just the voice I needed to change my perspective. I started reading this book just about when September started and it was influential in encouraging me to study through the book of Acts again -- which the book is anchored on. Readers were encouraged to participate in Max Lucado Community. I joined a group called "Read Through Acts in the Lucado Life Lessons Study Bible." A new chapter is posted each week day and members are free to discuss revelations and insights based on the reading of that chapter. The best part of the book, I believe is that prayer that ends in every chapter. I can imagine using this as a teaching tool to anyone who wants to grow deeper in her journey with God. In fact, if you think you are that person and currently live in the Omaha area -- I am personally inviting you to study it with me! I would be more than happy to meet you.